University home > Services > Library > ad-lib > Have You Taken an #lborostudyselfie Yet? £50 to be Won! Have You Taken an #lborostudyselfie Yet? £50 to be Won! 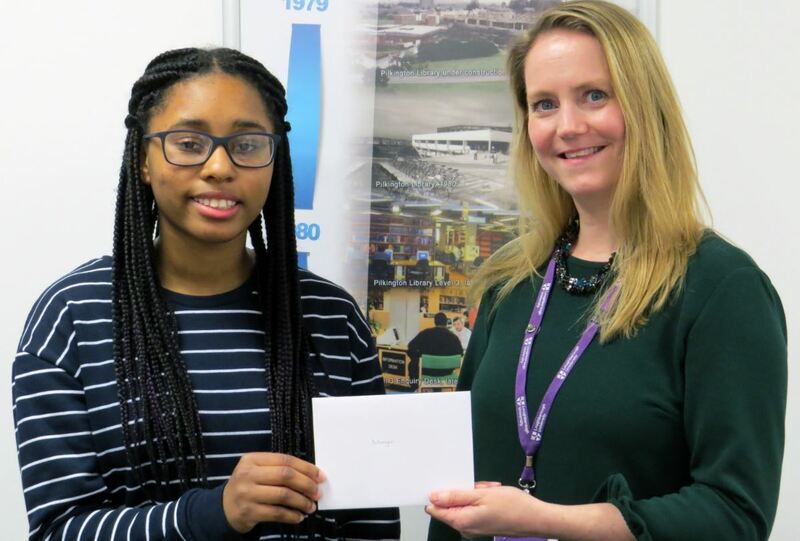 Our heartiest congratulations to Mayu Greenaway-Harvey for winning our Valentines’ Day themed ‘#lovelborolibrary’ competition. 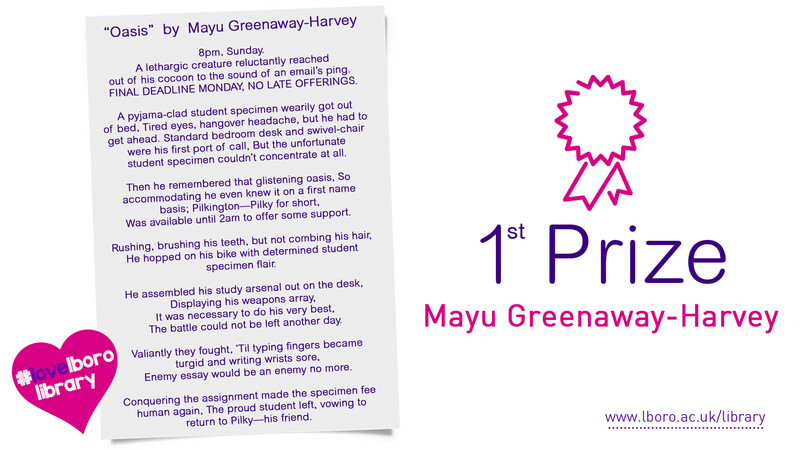 Mayu was presented with her prize, a £50 Amazon voucher, by the Library’s Assistant Director Helen Curtis. 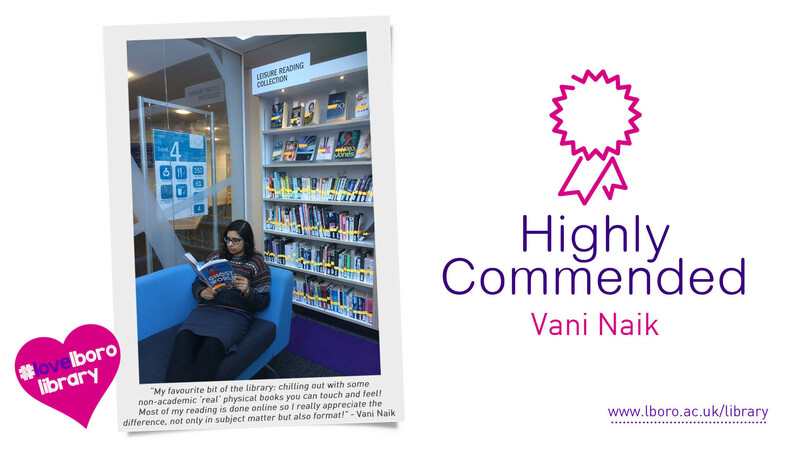 Here’s her winning entry, a rather lovely Ode to the Library! 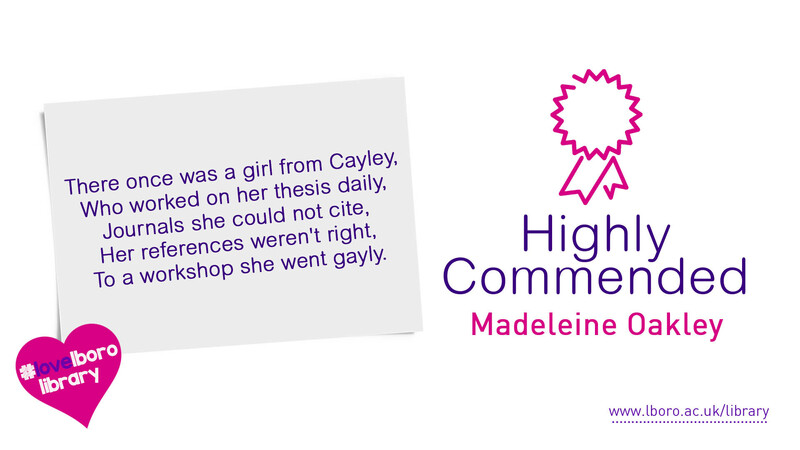 We were also very taken with these two entries, by Vani Naik and Madeleine Oakley respectively, which we award the status of ‘Highly Commended’! Thank you to everybody who took part. 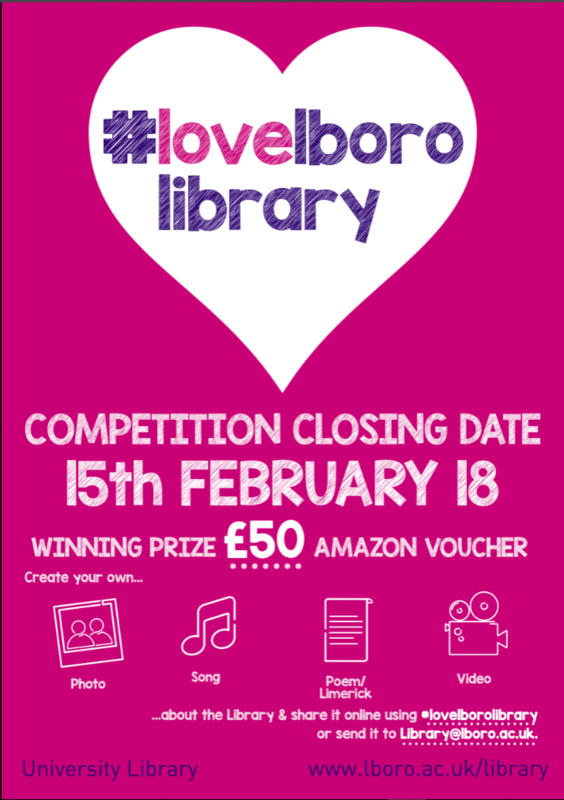 Tell Us Why You Love #Lborolibrary and Win £50! Love is in the air! It’s nearly Valentine’s Day and to mark the occasion we’re running a competition asking you to tell us what you love most about your lovely library! 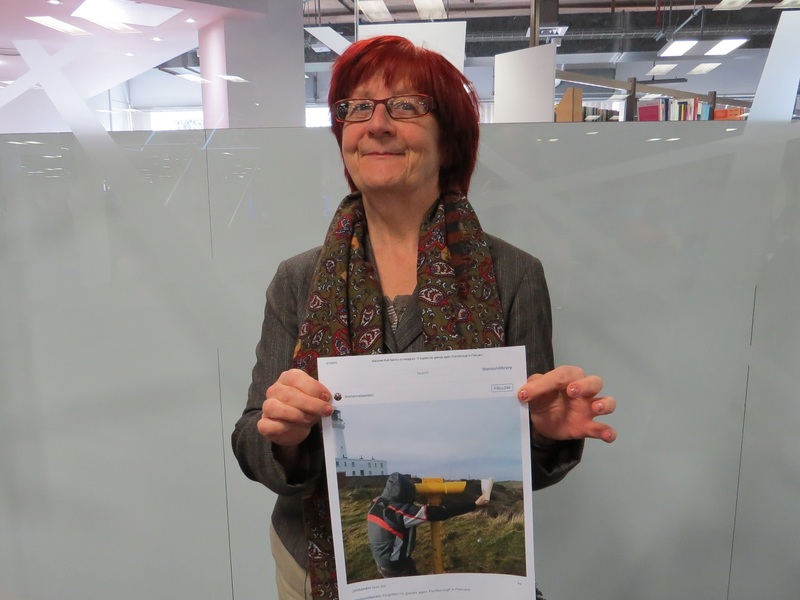 Express yourself and what you love most about the library through any creative medium that takes your fancy – a photo, a poem or limerick, even a song or an interpretive dance! Share it with us online on Twitter, Instagram and Facebook with the tag #lovelborolibrary or send it via email to library@lboro.ac.uk. Everybody who enters will be eligible for the grand winning prize of a £50 Amazon voucher! The competition will run from 2nd February to 15th February 2018. Participants can submit up to 3 entries. Each entry must have a title. 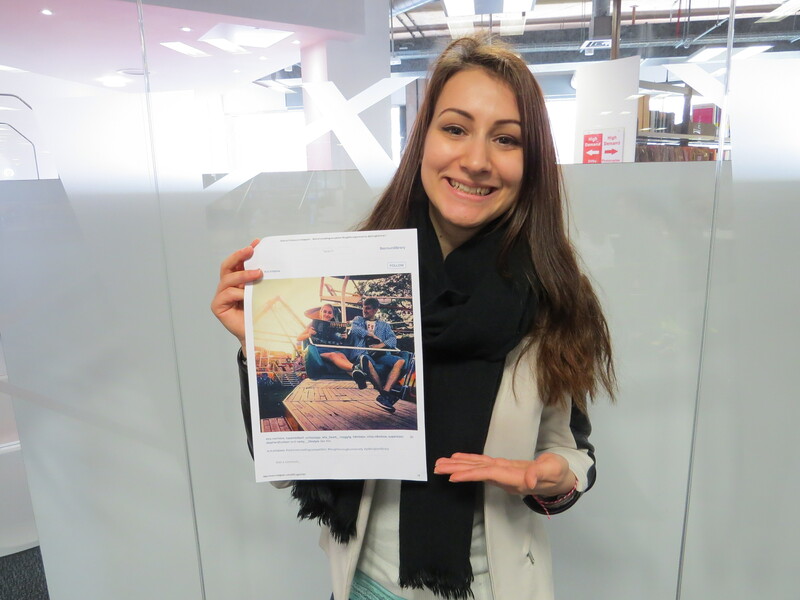 If submitting a photograph there are no restrictions in the use of any digital enhancements. The competition is open to Loughborough University employees and students. Entrants must obtain permission from anyone appearing in their entry. 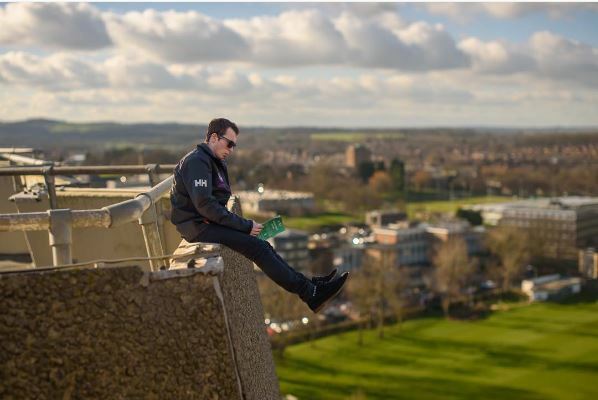 By entering this competition, you agree to let Loughborough University use this work for promotional purposes. Examples of this include but are not limited to, being included on the library’s website or in promotional materials produced by the library. We will select a number of entries to go on our Facebook page and then the University Library marketing group will make the final decision. Selection will take place after 15th February and a message will be placed on our Facebook page. We’ll also be running a stand in the foyer all next week with a special ‘Love Your Library’ theme, so look out for that too! Do you have a system for managing your references? Do you struggle to import references into your work? Have you previously used RefWorks or RefMe? Find out how Mendeley could help you organize your research, collaborate with others, and discover the latest research. Loughborough University is changing its site-wide licence from RefWorks to Mendeley. It is envisaged that the switch over to Mendeley will be complete by the start of the new academic year 2017/18. Come and visit members of the Academic Services Team in the Pilkington Library foyer, Tuesday 16th – Thursday 18th May, 12-4pm to find out more about Mendeley and how it could benefit you. Enter our free prize draw – stop by our stand to be entered in a draw to win one of several integrative presenters, USB Wireless PowerPoint Presenter with Laser Pointer pens. 20,000 Items Under the Repository! 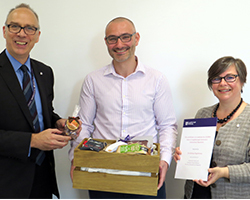 Dr Papathomas is pictured receiving his prize from Professor Steve Rothberg, PVC Research and the University Librarian, Emma Walton. The 20,000th item has been added to Loughborough’s Institutional Repository by Dr Anthony Papathomas, Lecturer in Sport and Exercise Psychology in the School of Sport, Exercise and Health Sciences. Dr Papthomas has thirteen papers and his PhD thesis in the Institutional Repository. The winning submission, co-authored with Brett M. Smith and David Lavallee, is available on the Repository here. The Institutional Repository, based here in the Library, ensures that Loughborough University’s research output is visible to the wider research community, increasing its impact and citation rates. It also assists authors in complying with funder Open Access requirements for their papers, including those of the RCUK and HEFCE. It contains a range of items including full-text journal articles, conference papers, book chapters, official reports, PhD theses and audio-visual material. 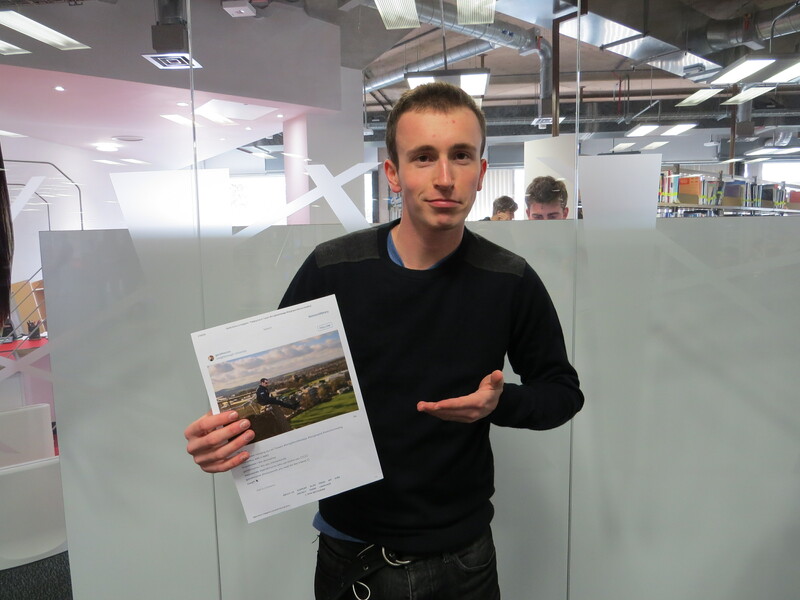 All three have collected their £50 Amazon vouchers and were kind enough to pose with their winning entries. A very big thank you to everyone who took part – we hope you had as much fun taking them as we did judging them! 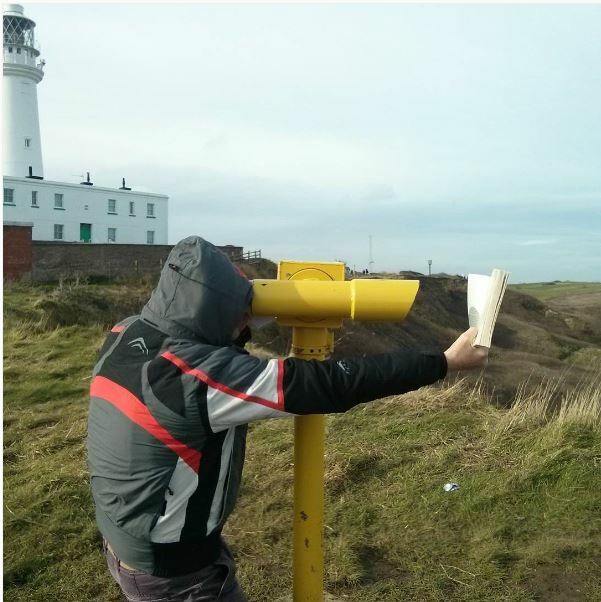 Every year the Library holds a photography competition and this year we would like your Instagram photos that capture your take on ‘extreme reading’. Whether it be on the beach, with the family cat, or (like Pilky) whilst doing a handstand, we want to see your pics! All we ask is that whatever you’re doing, please take care. 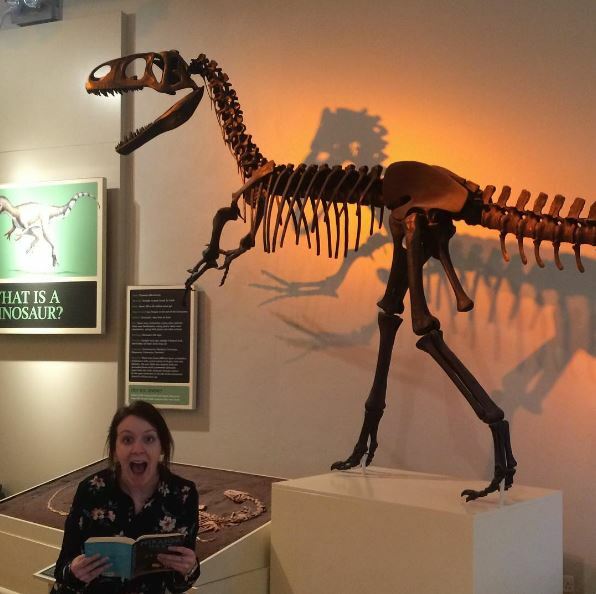 This is about being imaginative, not putting yourself in danger – for example, as Katie demonstrates, if you’re going to get yourself pictured with a dinosaur, make sure it is extinct first! Entrants can submit up to 3 of your own Instagram photos. There are no restrictions in the use of any digital enhancements. When Instagram photos are submitted, entrants to the competition should provide their name, address, telephone number, e-mail address and also their position in the University and where the photo was taken. 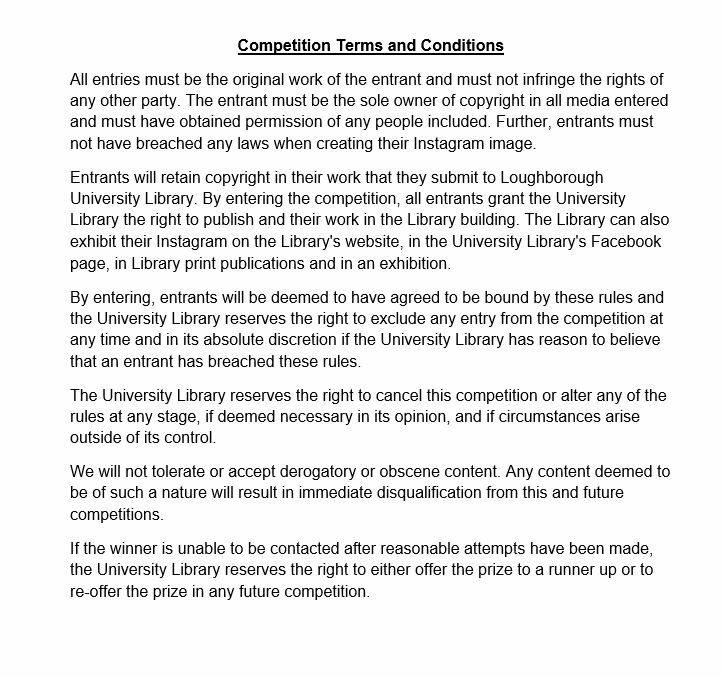 The University Library will only ever use your personal details for the purposes of administering this competition, and will not publish them or provide them to anyone without your permission. 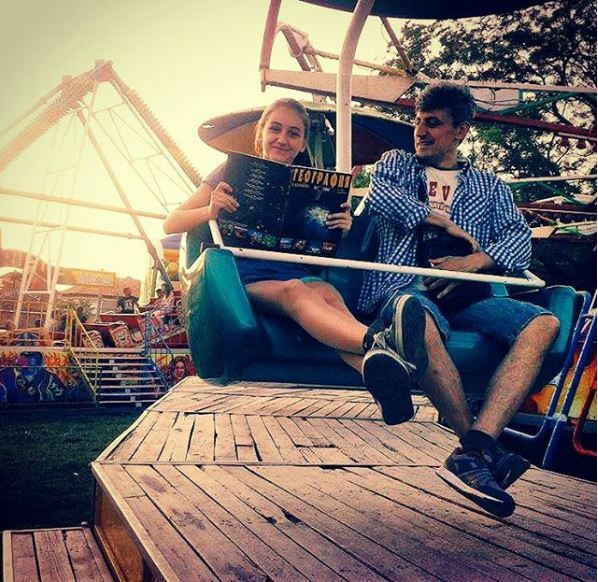 We will select a number of Instagram photos to go on our Facebook page and then the University Library marketing group will make the final decision. Selection will take place after 11th March and a message will be placed on our Facebook page. The 3 best entries will receive £50 Amazon vouchers each. 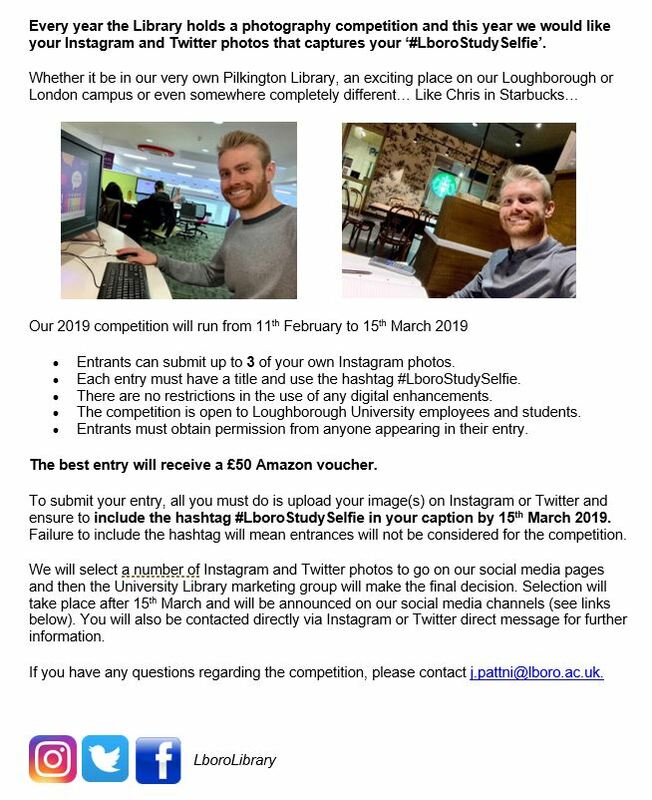 Entries should be sent as a link to the Instagram photo to k.l.jeffers@lboro.ac.uk by 11th March 2016. Budding artists may be interested in participating in this year’s John Ruskin Prize, a showcase run by the Campaign for Drawing for emerging talent and established artists from all reaches of the UK with a top prize of £5,000. This year artists are being asked to respond to respond to the theme: Recording Britain Now: Society, to re-assess their practice and focus on the prevalent social issues of 2015/16 and to engage with a society in rapid transition. The winners, alongside 15 shortlisted artists will be included in a high profile exhibition at The New Art Gallery, Walsall in early 2016 closely followed by a London showing at The Electrician’s Shop Gallery set within the unique surrounds of Trinity Buoy Wharf, London. The exhibitions will be accompanied by a series of talks and events linking with the V&A’s fascinating ‘Recording Britain’ collection and all shortlisted artists will be invited to feature on a free online catalogue featuring both collections exploring visions of Britain through to the present day as seen through the eyes of established and emerging UK artists. In 2012 The Guild of St. George, the charity founded by Ruskin in 1871, renewed its links with the Campaign for Drawing to inaugurate The John Ruskin Prize open to all artists over 18 working in the UK. It aims to uphold Ruskin’s belief that drawing helps us see the world more clearly and be more aware of its fragility. The Prize allows the Campaign to promote and give exposure to the work of emerging artists using a wide range of media and techniques. 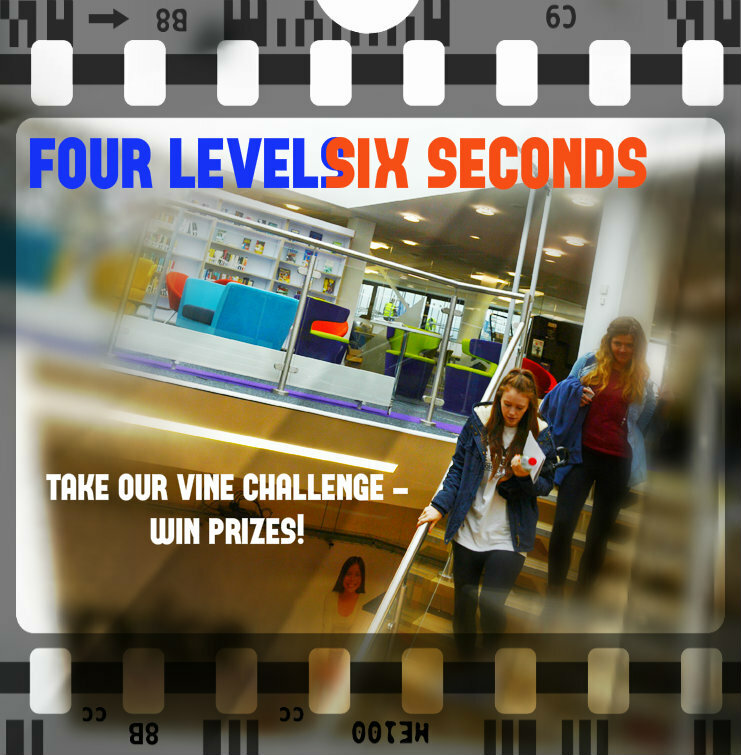 4 Levels 6 Seconds – Take Our Vine Challenge! Every year the Library holds a competition and this year the focus is to create a short video (Vine). We would like a Vine that captures 6 seconds of what makes your University Library great! We are keen to ensure our media presence is useful, providing news and information about our services but we also want it to be eye catching, engaging and relevant for students, staff and prospective students and this is where you come in. Maybe you want us to highlight the many resources we have, show off our refurbished spaces or perhaps you simply want us to be more fun. Whatever your take we want your Vine! Entrants can submit up to 3 of your own Vines. Each entry must have a title and may include an optional description. When Vines are submitted, entrants to the competition should provide their name, address, telephone number, e-mail address and also their position in the University and where the Vine was taken. 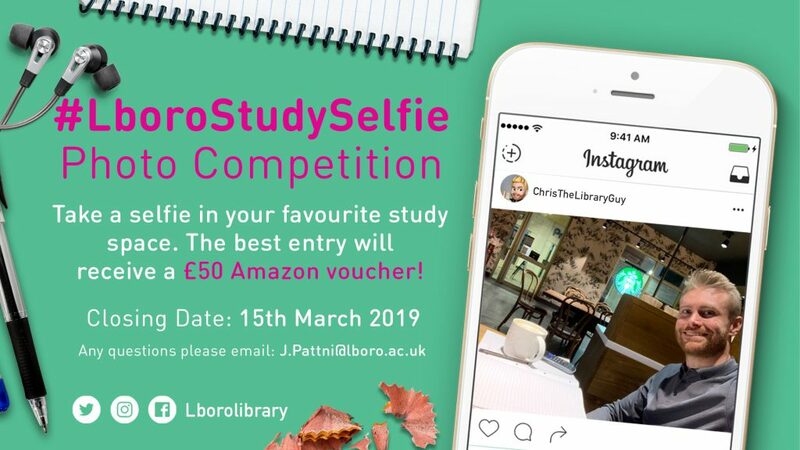 The University Library will only ever use your personal details for the purposes of administering this competition, and will not publish them or provide them to anyone without your permission. We will select a number of Vines to go on our Facebook page and then the University Library marketing group will make the final decision. Selection will take place at the end of May and a message will be placed on our Facebook page. The 3 best entries will receive £20 Amazon vouchers each. Entries should be sent as an email attachment to k.l.jeffers@lboro.ac.uk by May 15th 2015.